Prof Herve Morvan offers his insights and discusses some of the broader ideas raised by key players at the American Institute of Aeronautics and Astronautics Propulsion and Energy Conference in Atlanta, USA held 10th to 12th July 2017. 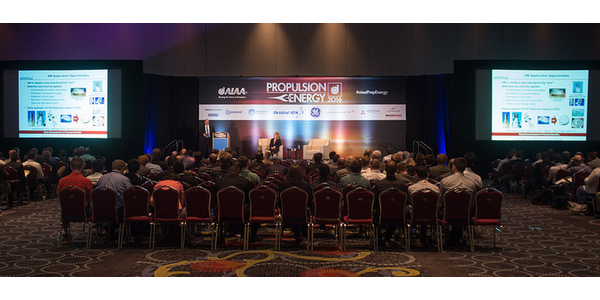 The American Institute of Aeronautics and Astronautics hosted the Propulsion and Energy Forum and it turned out to be a great event. Most of the heavyweights are in attendance from national labs and funding bodies, to new entrants with a particular interest in electrification and the many disruptive processes around it. The event has seen a wide range of people who have brought their unique perspectives and experiences to this forum. The plenary session: Safran, GE, Pratt & Whitney and Rolls-Royce offer their outlook on the future of propulsion. The session was interesting for the consensus it brought, but there was little that was new in the text. was good for the way it categorised things. The ‘show me the money’ statement is also very tangible of course for large and established businesses. His point was clear and honest – such enterprises have a large existing market and do not possess the agility that new entrants do. This includes agility in terms of size, opportunities (new markets) and also of mission (more on this later). Another of Epstein’s revealing statements looked at the future blended wing type designs. Here, ‘the environment trumps economics’ – the nature of our transport futures depends on and may require non-economic drivers and incentives. Environmental policies, and social pressures and needs will play a key role here; as do measures such as the ACARE targets, starting nearly two decades ago, naturally. Personal mobility through Uber for instance or the vision put forth by Paul Eremenko and his A3 colleagues, in the Airbus Silicon Valley outpost, as another extreme. 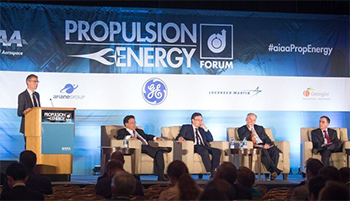 Participants in the panel discussion, “Aircraft Propulsion — What Does the Future Bring?” July 10 during the 2017 AIAA Propulsion and Energy Forum in Atlanta. How does this get achieved? Dr Epstein points out that, even if batteries were available, we may not want to go down that route (for medium to long haul flights). In countries such as the USA or China, this would have severe implications on the climate due to the way energy gets generated and this may be worse than a Jet A fuel powered gas turbines, he stated. Hybrid solutions offer a better way forward for medium and long haul airliners. Srinivasan the Argonne Lab speaker, later on Tuesday, that 750 Wh/kg was a ‘big number’ for batteries, with packaging needs seriously limiting the full potential of technologies such as Lithium-Air batteries (5,200 Wh/kg theoretical potential) to 10% for example. Delegates during the 2017 AIAA Propulsion and Energy Forum in Atlanta. Scale and range come into play, for reasons including engine efficiencies as well (for small GT engines are comparatively less effective than their large counterparts) as well as mission and use. In other words, personal mobility is the real disrupter in transport, not one that challenges commercial flight, but one that may take on the automotive market for example; and with the potential to embrace full electric. The boundary between this new ‘mobility’ market and existing ones is still blurred, as is the extent that this revolution presents an opportunity for established large players or a threat. At present, Airbus has entered the fray with A3 but the Uber project has also recruited the likes of Embraer and Bell Helicopter. On aviation training and thin-haul markets, we are seeing precursors arriving on the market with for instance, Pipistrel and its recent success in Fresno Co, USA. This may well be the interface between existing and new. In the defence sector, similar paradigms exist about the future, between (2a) hypersonics and (2b) recourse to a large number of cheap and ‘attritable’ small aircraft, at the other end of the cost and technology spectrum. This outlook is essentially similar to that of commercial transport (minus attrition on personal mobility, of course!). For (2b), as for (1b), autonomy and artificial intelligence bring opportunities and challenges here too; and public perception of such technologies will also affect their future. Alan Newby, Director of Aerospace Technology and Future Programmes at Rolls-Royce, asked a good question about pace. Will evolutionary changes be sufficient to meet environmental and societal targets? There is a need to think beyond pedigree. Newby presented an outlook that rethinks how we integrate a range of new technologies. The gas turbine however, is not dead and many make that point, including that it is not even plateauing in a performance sense. Instead, it is ready to be redeployed and perhaps reinvented using additive manufacturing for instance, a point made by GE and NASA, with significant gains and new opportunities that can come with resizing. Back to Alan Newby’s point however, it rapidly becomes clear in this model that those who master energy storage, as a part of a greater system, including gas turbines, will have a clear advantage – here we can see the focus of new entrants and businesses such as Tesla once again. This is the new (starting at least) paradigm, illustrated below in a slide that presents the current status of what the future holds for businesses like Rolls-Royce. 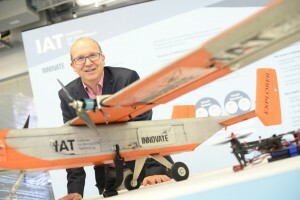 Professor Herve Morvan is the Director of the IAT and an aeroengine propulsion specialist in charge of G2TRC. 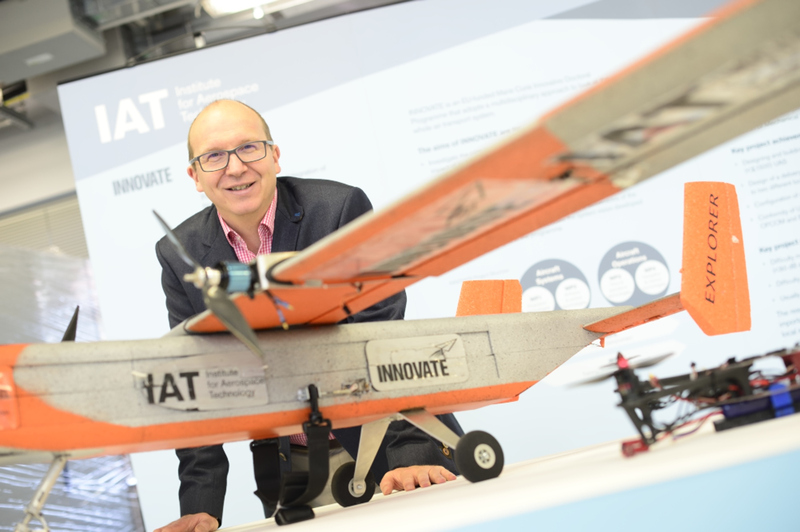 He is one of the six Directors for the ‘Propulsion Futures’ beacon programme and looks after industry activities and the programme flying demonstrator. University of Nottingham’s Propulsion Futures beacon is driving the discovery and translation of new materials, components and technologies to drive innovative electrified propulsion systems in a new age of sustainable transport. The beacons will drive significant inward investment to our internationally renowned research areas, and support our ambitious vision by increasing collaboration, strengthening networks and partnerships, attracting diverse funding, and raising the reputation of our world-changing research. 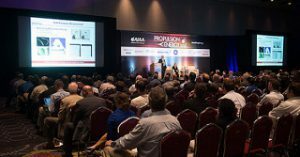 The American Institute of Aeronautics and Astronautics hosted the Propulsion and Energy Forum, American Institute of Aeronautics and Astronautics. Currently, bulky and heavy batteries combined with PV panels whose efficiency needs a boost, make a portable electricity source an unattractive option for most lightweight vehicles. We hope for the best from the research. I agree with you, this post also very insightful, At the same time If anyone faces any problem related to AOL they can take a help of Aol support to troubleshoot their problem.